The Swiss have more than cheese and chocolate? As I looked through the ground candy overflowing with abundant goodies (minus the cilantro which tastes like dish soap to me which I’ve been told indicates an allergy to it), I discovered Swiss Chard among the bounty. I’m normally a veggie person, believe it or not, but I’d never had reason or cause to select Swiss chard as a vegetable option. Truthfully, I thought, “The Swiss have something besides chocolate and cheese?” Okay, color me ignorant about that, but I had no idea how to cook it, or is it one that is eaten cold? Off to Google I went! Miss Chris, our farmer delivery woman, suggested a bed of olive oil sauteed onion strips and minced garlic to which the chard is added and cooked only until it just wilts. The stems can be put in with the onions and garlic as the start of the saute’. Wanting to add another option, I discovered a similar recipe on THIS SITE. Make sure to read the reviews for more tips, ideas, and recipe additions. This entry was posted in Business, Herb and Plow CSA Articles, Human and tagged abundance, cooking, csa, delicious, ground candy, guides, recipe, tips. 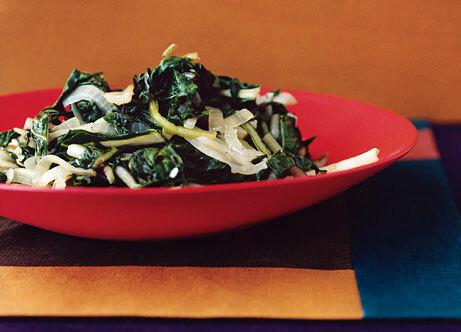 Are you serious you never had chard? I think you just didn’t know it was because I used it any time I could get it -even mixing it with spinach to stretch the volume. My parents used to grow it in their garden at Rodenburg’s. Glad you discovered another great leafy green!